It’s a special time of year, SIMON 2.0 is a special kind of pickleball machine and we are bringing you a very special deal (GOOD TIL November 30th) to help you put a SIMON on your Christmas list. Simon 2.0 will fire balls as quickly as one every 1.5 seconds with the new 4-Ball Turbo Carousel. Creating a great cardio workout. Simon will shoot lobs seemingly a mile high as well as the most delicate perfectly placed dinks with the new Any Lob – Any Dink Adjustable Snap-On Ramp. There is NO shot that SIMON 2.0 can’t shoot…perfectly, naturally. SIMON 2.0 now comes with wheels. Though he only weighs 32 pounds ( a mere 4 pounds more than TUTOR ), now you can roll SIMON easily to any spot on the court or to your car. SIMON 2.0 now comes with an optional ($79) fully wireless on/off remote control with range up to 100 feet. And SIMON 2.0 still holds a whopping 160 balls and runs a full six hours on a single charge. Talk about heavy duty. and pick SIMON 2.0 with Remote to add to your cart. When you checkout use the coupon code BlackFridaySimon and you will receive a full $125 off the total package, plus FREE shipping. This deal is good only through November 30th. 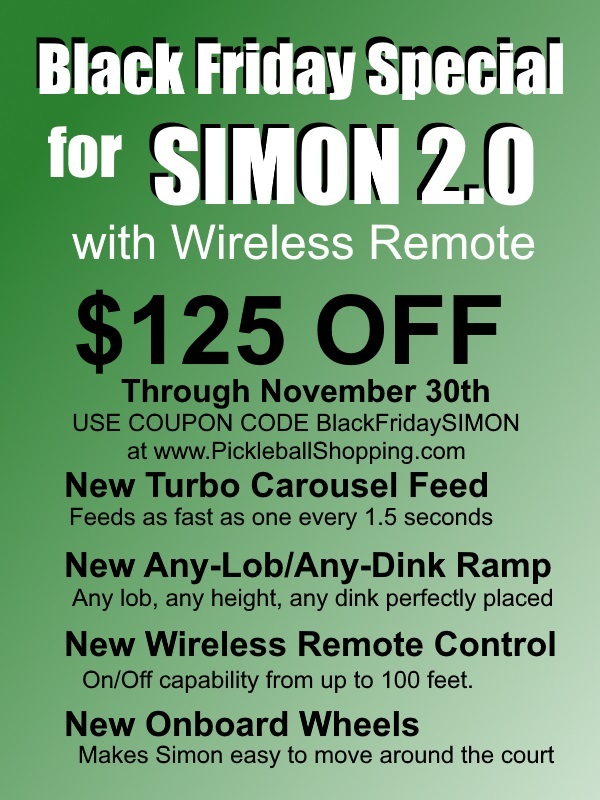 USE COUPON CODE: BlackFridaySimon to receive $125 off SIMON 2.0 with Remote through November 30th. It has been a long time coming, but one of the wildly popular Pickleball Rocks 5.0 Shootouts is coming to Arizona on Saturday February 18, 2017. Open to only the first 8 men’s teams and first 8 women’s teams to enter. The fabulous Pebble Creek Pickleball Tournament (Feb 15-18) in Goodyear, Arizona is excited to open up their traditional senior tournament to now include one of our popular one-day Pickleball Rocks 5.0 round robin shootouts. The shootout will be a fun one-day event with music, food, high level pickleball and prize money. Consists of playing each of the other 7 teams one game to 15 win by two. Each match you win, you will be awarded 15 points from your match plus 5 bonus points for the win. The losing team receives the number of points scored up to a maximum of 13. At the end of the round robin, the two teams with the most points will play a best 2 out of 3 match to 11 Gold Medal match with the first place team winning $250 and the second place team winning $100. Teams where at least one of the team members is under 50 years old and at least one team member must be rated 5.0. Registration: Get your team in quickly since this one day special event will fill up quickly. Registration opens for the Pickleball Rocks 5.0 Shootout at high noon EST Wednesday November 16, 2016. If you’ve never played at PebbleCreek in Goodyear, we highly encourage it. The PebbleCreek Pickleball Club runs one of the best tournaments on the planet.